Now in its fourth year, Chicago’s citywide summer tradition of free Shakespeare returns to 18 communities across the city’s north, west, and south sides from July 17th to August 16th. We invite you to join us this summer for one of the 26 performances of Shakespeare’s Greatest Hits. Against the backdrop of our city’s vibrant neighborhoods, friends and families will delight in a mash-up of Shakespeare’s most memorable scenes and characters that continue to capture the timeless range of human experiences. 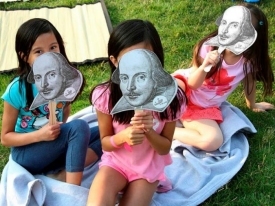 The first night of Shakespeare in the Parks will kick-off at Polk Bros. Park, south lawn in front of Navy Pier on Friday, July 17th at 6:30p.m, and Saturday, July 18th at 6:30p.m. Grab a blanket, pack a picnic and come enjoy a Night Out in the Parks. For more information, visit www.chicagoshakes.com.